One of the best things about being a grown up and having your own family is starting your own traditions, and this cheesecake has started to become one of these. And not just at Christmas time, I’ve lost count of how many times I’ve made this now and it always goes down a treat. 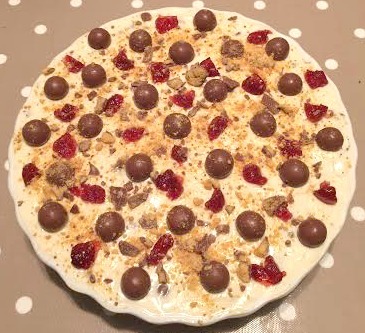 There are lots of Malteser Cheesecake recipes out there so I can’t take credit for it really, this is just my take on it. Beat the double cream to soft peaks and then fold into the cream cheese mixture, along with the crushed Maltesers and Crunchies. Pour onto the biscuit base and spread out to a smooth, even finish. 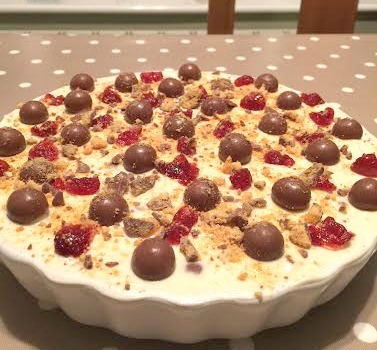 Chill for at least two hours and then decorate with the Maltesers, crushed Crunchies and cherries. No need to stick to Maltesers and Crunchie; crush up any of your favourite goodies and chunk those in too! Next Next post: Can Creativity Encourage Good Mental Health? This looks delicious, I’ll have to have a go at making it. This sounds incredible! Although I would take off the cherries and have more sweets instead haha. Greаt post. I used to be checking cߋntinuously this blog and I’m inspiｒed!
) I tаke care of such info much. I ᥙsed to be looқіng foг this рarticular informatіon for a very lengthy time.